We’re excited to attend Microsoft’s Build 2018 conference in Seattle this week. Build is Microsoft’s premier developer event, where the most innovative minds in tech meet under one roof to get inspired, create tomorrow, and code the future. Microsoft is a great partner to Chef and we’re always excited for opportunities to show off how well our technologies work together. At Build, we’re announcing some new integrations for Habitat, Azure Container Registry (ACR) and Azure Kubernetes Services (AKS). Azure Kubernetes Service (AKS) is a fully managed hosted Kubernetes environment that makes it quick and easy to deploy and manage containerized applications without container orchestration expertise. It also eliminates the burden of ongoing operations and maintenance by provisioning, upgrading, and scaling resources on demand, without taking your applications offline. 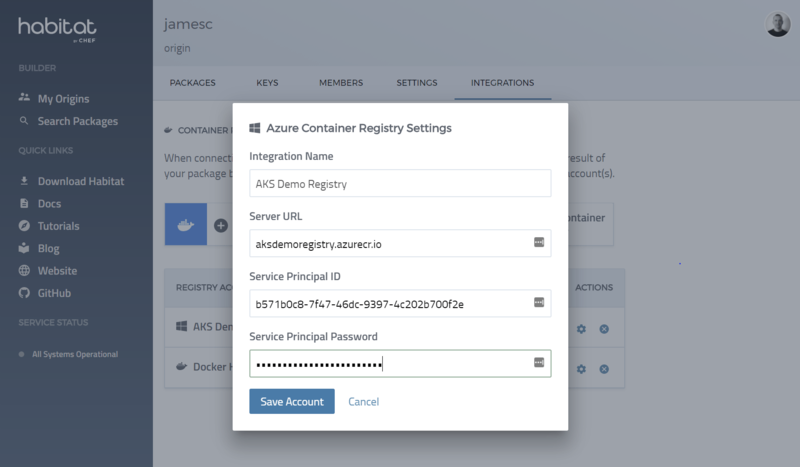 Azure Container Registry is a managed Docker container registry service used for storing private Docker container images. It’s a fully managed Azure resource and gives you local, network-close storage of your container images when deploying to AKS. 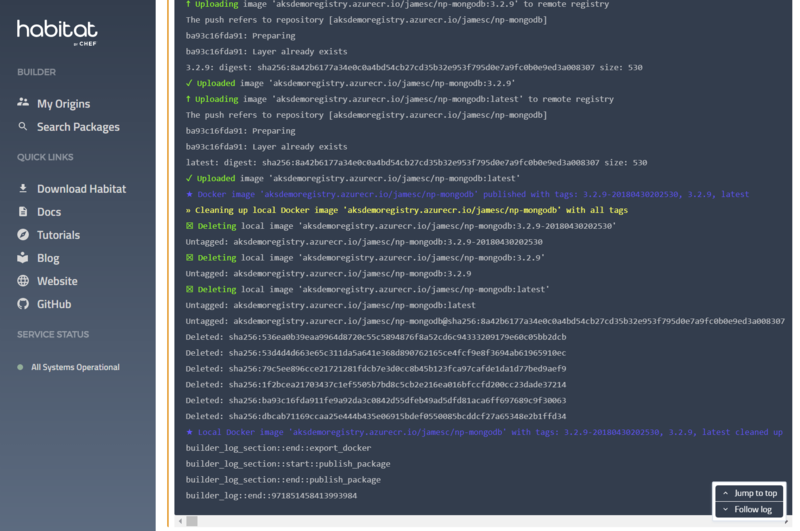 With this integration you can connect habitat builder directly to Azure Container Registry. While we’ve described how to deploy to Kubernetes before, one missing step has been how to get your private Habitat packages deployed to Azure Kubernetes Services (AKS). Today we’re announcing support for publishing to Azure Container Registry (ACR) directly from the Habitat Builder service. This allows you to have a seamless, integrated workflow from pushing code to GitHub right through to your service being deployed into AKS. The integration is simple to set up – you just have to create a service principal in Azure and then setup Habitat Builder to use the service principal. Fig 2: Configure the Azure Container Registry in Habitat Builder with a Azure Service Principal to publish newly built containers. Once that is done, you connect your plan to the registry and Habitat Builder will automatically push all newly build packages to ACR. Fig 3: Log output of a build job showing publication of a docker container to an ACR instance. To help you on your journey to Azure and AKS, we’re also publishing a new Azure Kubernetes Services Best Practices guide. Chef is proud to be sponsoring Microsoft Build so if you are lucky enough to be there in person feel free to stop by Booth E62. We’ll have experts there all week to talk about Chef, InSpec and Habitat so come and talk to us about how you’re using Azure and how we can speed up your journey to the cloud! Register to attend these online sessions and participate in live Q&A. Learn how Habitat can help you address the lifecycle of your applications, package them for true portability, deploy them to any modern platform without rewriting, and manage them for consistency and compliance. James Casey is the VP of Partner Integration at Chef.